We’ve all been there…you climb into your car, turn the key and click, click, click. The dreaded dead battery! And it never happens when you have hours to spare, right? Not to worry…Stanley has the solution to your problem. 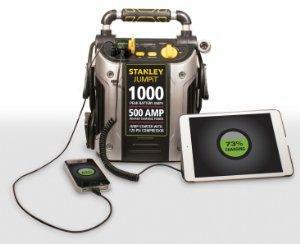 The Stanley series jump starters allow you to jump your battery back to life without the need of another vehicle. These jump starters pack the power you need, from 600 peak amps all the way up to 1000 peak amps, it’s like CPR for your car! Ever need portable power? Who doesn’t these days? 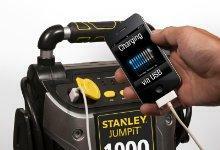 The Stanley series jump starters has you covered with a USB power port and 12 volt DC outlet. So if the lights go out due to a weather emergency or you just to need to charge your cell phone, tablet or laptop, you’re good to go. Portable power on the go! -120 PSI compressor. (Note: Available on J7CS and J5C09 only). -12 volt DC ports / ultra bright LED light. 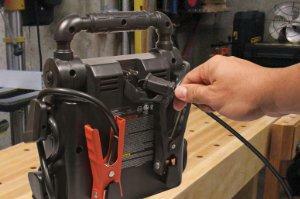 Hook it up to your battery, turn the switch on and start your car. It’s that simple. You’re back on the road in no time. With cell phones, tablets, laptops and gaming systems ever more present in our everyday lives, who couldn’t use a little extra power on the go when those devices get low? And how about these other cool features like a 120 PSI compressor with a brass tipped SureFit nozzle for secure connections? Perfect for inflating your car tire, sports equipment, bicycle tires or anything else that needs to be pumped up. Note: Available on J7CS and J5C09 only. Charge two devices at once with the USB and 12 volt DC port! 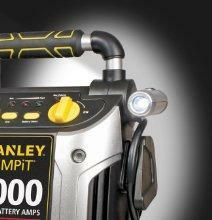 The optional DC plug also allows you to charge Stanley’s jump starters with your vehicle’s DC port. Plug it in and keep it ready to go at a moment’s notice. If your battery go dead when it’s dark, no problem! The ultra bright LED light swivels 270 degrees and shines light just where you need it.